Last year I followed the life cycles of two species of butterfly that frequent my garden, taking pictures at each stage: the Monarch (Danaus plexippus) and the Eastern Black Swallowtail (Papilio polyxenes). Every year I bring some eggs of each species in from the garden and raise them indoors. The Monarch diary was completed when they eclosed for the migration south, but the EBS story wasn’t quite finished. Some EBS caterpillars will eclose in late summer/early autumn and overwinter as adults while others will overwinter as chrysalides and eclose in spring. Last year five EBS chrysalides did not eclose, so I placed them in a vase (still on their twigs) and put them in the garage. When the weather warmed up somewhat in early April I moved them to a sheltered patio outside, placed under an old glass lampshade to protect them from wind and marauding critters. They’ve now begun to emerge; below is one that eclosed today. There was one that eclosed yesterday, but it flew off before I could take a picture. Another is set it eclose tomorrow, possibly even tonight, because the cuticle has begun to go transparent and the wing pattern showed through. Pray forgive the dirty hand; I was working in the garden when I remembered to check on them. This one is a female, which is distinguished by the relatively large amount of blue on the hindwings. Although it buggered off as soon as I finished taking the picture, I have no doubts that this selfsame female will soon be back to lay eggs in my garden (probably on the dill because I’m late starting the carrots). Unless something eats it first. 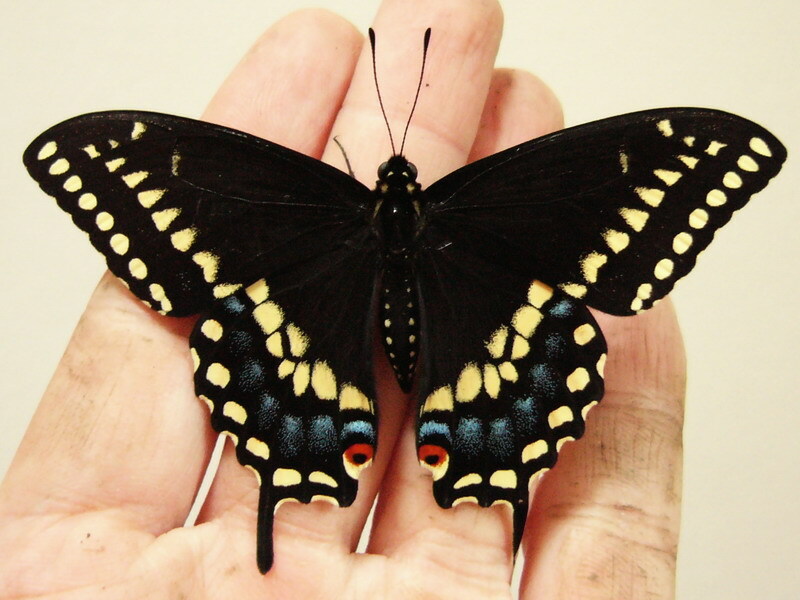 This marks the full conclusion of last year’s butterfly diary for the Eastern Black Swallowtail. And the Iris ‘Hello Darkness’ is finally blooming! I planted it last summer so I’ve never seen it flower; it budded over a week ago and I could hardly wait. It was well worth the wait and I’m SO happy with it. The Northern Blue Flag iris (Iris versicolor) is all set to bloom as well, and the Siberian Iris ‘Blue King’ has been in bloom for a week already. Can’t see the garden for the plants. A couple weeks ago I traded some lovage (Levisticum officinale) divisions for a few decorative heirloom vegetable seeds. So far I’ve started five ‘Red Burgundy’ okra (Abelmoschus esculentus) and four ‘Ip Ssam Hong’ Chinese cabbage (Brassica rapa) plants. I got some red orach (Atriplex sp.) seeds too, but I’m not sure what I’ll do with them. Space in the vegetable plots gets more limited with each seed I sow. The peas have sprouted, the onions are planted, the first crop of lettuce is sown, the radishes are ready to be harvested, and the new strawberries (Albion, Veestar and Cabot) are planted. Now I have to finish the wiring on the trellis to plant the hops (Humulus lupulus) and the ‘Blueberry’ grapevine (an ironic name if there ever was one) along. Then that just leaves the potatoes, the carrots and the beetroots to be sown, and the tomatoes and cucumbers to be planted out. Theoretically I don’t have a problem with planting vegetables among the flowers, but in practice I haven’t been able to bring myself to do it. Partly it’s that most of my ornamentals are native species, so they’re used to hot dry summers and clay soil and I don’t have to water them much. Vegetables, on the other hand, seldom appreciate either condition. I also got a lot of new flowers in the past week. I’d thought that three of my rosebushes had died over winter, but as it turns out it was just one. The other two died back almost to the ground, but are resprouting from the bud union. Whew. So right now I have two rosebushes in pots and I’m not sure what to do with one of them. Seriously, happiness is having more roses than you know what to do with. I’ve have to update the rose page soon. There are also yellow stargrass (Hypoxis hirsuta) for sun, trout lilies (Erythronium americanum) for the woodland bed, and ‘Lingholm’ Himalayan blue poppies (Meconopsis x sheldonii ‘Lingholm’) for the shade containers. The trout lilies are true spring ephemerals and are almost dormant already. The blue poppies I have coveted for ages untold; I’ve never had any success growing them from seed, so this year I said, “Screw it,” and ordered some plants. Also for a container in shade is the ‘Winter Dreams Black’ hellebore (Helleborus x hybridus ‘Winter Dreams Black’). And in a couple weeks my Master Gardener group is having our spring plant sale, so I’ve been digging and potting up things to donate. There are little pots of plants all over the place now. It’s a very pleasant time to be out in the garden right now, because both my lilac bushes (Syringa vulgaris) and my neighbour’s apple trees are in bloom right now and the garden smells better than it looks.